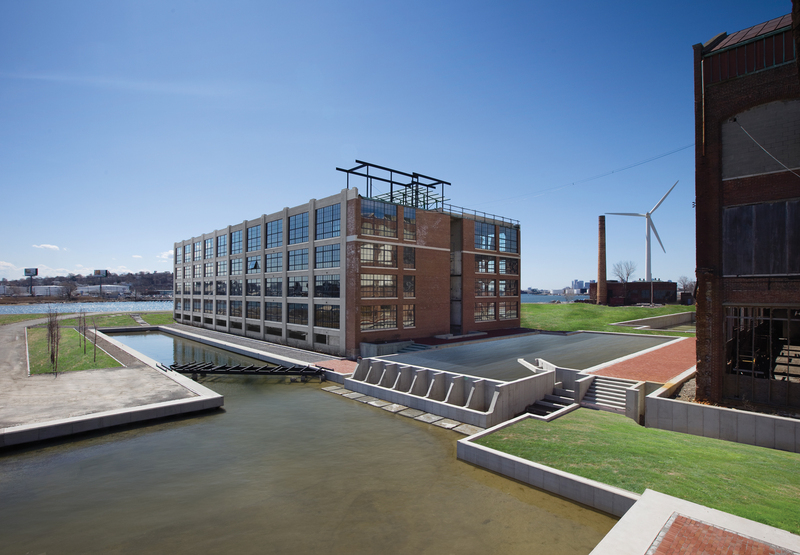 On a former brownfield site across the river from downtown Boston, a renovated turn-of-the-century lithography factory trades in carbon copies for a lighter carbon footprint. The elaborate storm-water management system was engineered specifically for capturing and recirculating storm water from Building X (above). Two fish ladders and large expanses of restored salt marsh encourage wildlife to breed nearby. In the distance, the turbine spins animately beside the Forbes factory’s defunct chimney. Forbes Park will be a pedestrian preferred site, with cars directed immediately into an underground parking facility beneath Building X. A footbridge leads from the building to an eco-trail, whose main feature is a cluster of five Civil War–era pin-oak trees that were spared during the construction process. Fittingly, a project that is sure to become one of the city’s newest landmarks nods to this vernacular tradition while concerning itself with a new climatic issue: energy consumption. The chimney of Forbes Lithography Company’s defunct boiler house stands as a foil for the 240-foot turbine perched beside it—the icon for Urban Design and Development’s ambitious mixed-use redevelopment project, Forbes Park, located along the greater Boston waterfront in Chelsea, Massachusetts. Upon completion, the newly dubbed Forbes Park will boast 600 residential units, and 12 acres of restored marsh and coastal grassland will become a public park while serving as a bastion for renewable energy. The idea is that the turbine, which will produce one million kilowatt-hours of power annually—a surfeit of free, clean energy—will glow with lights that use a three-color system to indicate the status of the regional power grid. The message will also be conveyed inside each residential unit via small industrial lights, called “Forbes Orbs,” which will advise residents to curtail energy use or proceed with tasks like laundry and dishwashing depending on the building’s level of power generation. The 70 residential units in Building X—the first building to be renovated in this four-phase plan—range from 686 to 1,233 square feet and start at around $244,000. Adhering to a strict 80 percent recycled material policy, the developers preserved much of the building’s original structure, including the exposed brick interiors and unique funnel-shaped support columns—whose high thermal mass works in concert with the building’s passive heating and cooling features. In order to get natural light and air circulation into each unit, the architects split the nearly 100-foot-wide building in half, creating an open breezeway through the center of the structure. This allows for windows on at least two sides of each unit. During the warmer months, the central atrium creates a chimney effect, sucking warm air out of the units and venting it up and out of the building. The large prefabricated steel windows push open from the bottom, increasing air circulation and obviating the need for air-conditioning. “This is the first project where we’ve completely eliminated drywall from our design vocabulary,” developer Blair Galinsky says proudly. “These units also don’t have painted surfaces, they’re just the natural, pre-existing materials.” In addition to passive structural features, all the energy-efficient accoutrements are in order: dual flush toilets, Energy Star appliances, FSC-certified red oak partitions, and a strong link to the outdoors with 7,000 square feet of shared roof space. Like many turn-of-the-19th-century industrial sites, the Forbes factory pre-dated the existence of the EPA and the local DEP, and its owners had no qualms about polluting the site and nearby water source. “The previous owners used the Band-Aid approach,” explains Galinsky. “We bought the site knowing that we would shoulder the burden of the cleanup, but the state has a great tool for brownfield developers called a ‘covenant not to sue.’ Rather than penalizing the state for the pollution, it encourages cleanup by offering loans, grants, and some liability risk protection.” Though the units hit all the key notes—and hues—in the spectrum of sustainable design, it is the restoration of the natural site that really sets Forbes Park apart. In some cases, the most brilliant change is that of brown to green.